A tight game at White Hart Lane, where Everton, lacking the attacking threat of both Fellaini and Arteta, nullified Spurs’ attacking options well. 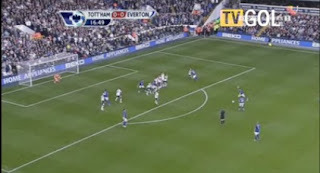 Heitinga was deployed in a virtual man-to-man marking role on van der Vaart, Seamus Coleman doubled-up well on Gareth Bale, and Leighton Baines handled Lennon exceptionally (see the below Chalkboard to see how often he got in behind him). It was left to Luka Modric to be the creative spark for Spurs, and he nearly came up with a goal, drawing a good save from Howard, and skidding one shot just wide in the second half. The chance of the match fell to Peter Crouch – a header 6 yards out on the stroke of half-time was planted straight into Tim Howard’s grateful hands. Question marks have been raised about whether Everton’s free-kick should have been awarded, but I’m not sure that the referee could have done anything else. Firstly, worth noting the referee’s view, as Pienaar feeds the ball into Yakubu; it is partially obscured by Palacios’ position. However, he can’t help but failed to notice Kaboul charging in to try to win the ball – sometimes it’s better to stand off, especially in a situation like this where the doesn’t seem to be any immediate threat. Yakubu clips the ball around the corner, and goes down on the turn as if he’s had his legs taken – he hasn’t. However, it’s clear to see that Kaboul does have both hands on him. Not enough to send Yakubu to the ground, but it’s clever forward play, and Kaboul was punished for a bit of naivety. What a free-kick. You don’t see Gomes beaten from too many of these, but Baines really does get this spot on. Over the wall, and right into the corner. Gomes barely even moves – he is well beaten by a great strike. Spurs did well to get back on level terms so quickly, and it was a shame that we couldn’t find a winner after an industrious second half performance – the result was probably a fair reflection though, and it is by no means a bad result, especially after a tough test in midweek. One brief comment on the team selection – I was disappointed that Crouch started up front, and he did nothing to change that opinion, despite getting an assist. His finishing (the header and the two chances with his feet) show the sort of form he’s in – in my opinion this was the sort of game were Pavlyuchenko may have been a better option. Whilst he offers less of a presence, his movement helps to create space for our other attacking players, and his goal record is far superior to Crouch’s. It will be interesting to see what line-up Redknapp opts for next week. Got nervous the moment I saw Baines getting ready to take the free kick from that position. He can hit them like Beckham on occasion and it just made me nervous. Was the perfect angle for him with the left footed shot. We certainly learned too that Peter Crouch can't shoot with his left foot. Can't wait for Defoe to return, especially considering he was only originally said to be out for the same time as Theo Walcott and now Walcott's back playing for Arsenal. Surprised too that Bale wasn't rested or that Kranjcar wasn't given a game. Even more surprised when Bale was switched to the right. Palacios is becoming a liability: five minutes for a yellow against Inter and 9 minutes for a yellow against Everton. Sandro is a better option though he is just as free with the uneccesary fouls. I don't count a goalkeeping error and an inadvertent deflection as an assist. Ref was terrible throughout and I think you are being charitable with the freekick for the goal.. Yakubu may have been 'clever' throwing himself on the ground but surely it's up to the ref, or his so called assistants, to see these things? The ref also didn't help Crouch who was definitely the sinned against rather than the sinner in this match. He was fouled just about every time he went near the ball and we should have had one or even two penalties for fouls on him. But having said that why oh why was he playing in the first place? Everyone I know assumed that Keane's appearance at the San Siro was to save Pav for Saturday. (Impossible to come up with any other reason for bringing him on...) 'Arry does do some strange things and not playing Pav on Saturday was up there. Yes he is frustrating but there is some chance of his scoring and he is actually a good passer of the ball. Bringing him on for Lenny reduced his possible affect on the match as did playing him with Crouch - who was meant to go where? I think if he had started we would have won. Jill - I thought that the ref had a decent game, and the only thing that I thought he got totally wrong was Heitinga's swipe at Bale, which was a nailed-on yellow in my opinion. Crouch needed to stand his ground in those aerial battles - the Everton players have every right to stand theirs. I can't agree that the ref had a decent game. It was one of the worse performances that I have seen. You may excuse him for giving the Yakubu dive, but if he didn't clearly see the foul then he shouldn't give it. This is half of the problem with referees. They give what they think they see rather than what they actually see! This is why many of them are so easily conned. It is also true that Crouch should be stronger. However, according to the laws of the game, if, as a player is jumping for a ball, an opposition player behind him, who has no intention of going for the ball himself, deliberately pushes him in the back to unsettle him, then it is a foul. You claim that Kaboul had both hands on Yakubu and that this partially justifies the refs decision in this case, so the same should be true when Crouch is pushed in the act of jumping. I normally think that your analysis is great and agree with most of what you write, but I think that you are well off base on this occasion. I am getting tired of teams coming to White Hart Lane to try and stop us playing football by mainly foul means and referees being too incompetent to see what is going on and punish it accordingly. This seems to have happened in every home game so far this season. "Crouch had a peculiar game against Everton on Saturday. Aggressively double marked at set pieces, with one defender in front and one behind, he was repeatedly buffeted to the ground as the ball was delivered, losing out not by foul play, but by his own inability to compete at the jostling and ground-standing aspects of what it is still a contact sport. By the end Crouch appeared to have spent most of the game either flat on his back or appealing to the referee for a (non-existent) foul. He did set up Rafael van der Vaart's tap-in with a deflection off his thigh. He also never stopped trying. But the increasing impression is that Crouch may be a busted flush at this level." A little nudge in the back mid-jump is not enough to give a penalty. The Kaboul/Yakubu challenge isn't comparable as Yakubu has control of the ball. Crouch doesn't have control of the ball, as it's in the air, and he's challenging for it with two players. I'm with Anon!! Pushing someone before the ball arrives is a foul - end of - and that was Everton's continuing tactic as the ref was letting them get away with it. I too am fed up with negative play from opposing teams and refs who are indeed incompetent. The strange thing is I think it is the price or our (relative) success at the moment that games at the Lane are worse and worse as more and more teams come with no intention of playing football as we'd like to know it. I am also totally sick of pundits defending such tactics as 'well what do you expect teams who can't compete on skill to do?' Show me a team in Spain that plays like Stoke, Blackburn, Wolves etc..... It just doesn't happen. What we lack is the strike force to overcome such teams at the moment, particularly when Crouch plays. (and as for Keane don't get me started). I personally can not see a lineup that successfully accommodates our best players when Defoe is fit. I think he and VDV upfront without a 'big' striker will be a disaster as Defoe can't hold the ball up well enough. Lennon should not have been substituted in my opinion. Pav should have replaced Crouch who was not at all effective since earlier on or perhaps should even have been there right from the start as he is a more technical player than Crouch and can dribble and shoot.. I am sorry to say that Harry does not always do his selection properly. Jill - thaks for coming back and following up! I agree that a blatant push when showing no intent to play the ball is a foul, but I didn't see any of the Crouch/Jagielka/Neville aerial duels that way. In all cases, none of them had the flight of the ball IMO, and the Everton players have every right to stand their ground and jump with Crouch. I think that so long as we keep the ball, Defoe and van der Vaart can work. Against teams who will have the majority of possession, it will be harder, and that's when Crouch may need to start. Well said Jill! I didn't realise that you had to have control of the ball before you can be fouled! If your attempt to reach the ball is deliberately prevented by a push in the back, I always thought that it was a foul. I also think that to describe what went on this Saturday as "a little nudge in the back" is entirely missing the intent involved, as well as minimising the severity on a couple of occasions. Finally, I am sorry but I have never seen a positive write-up about Spurs in the Guardian. Last week they managed to turn a preview of the Milan/Spurs match into a commentary on the problems at Liverpool. So, excuse me if I don't take too much notice of their views. Crouch was poor on Saturday, but the referee was far poorer. Anon - obviously I'm not naive enough to think that you have to have control to be able to claim a foul. My point was that the ball was up for grabs, and the Everton players were tougher in their attempts to get it IMO. I've watched the Jagielka/Neville "sandwich" about ten times now, and still don't think it was a foul - Crouch didn't even have the flight of the ball. A lot of the action on Crouch (not the penalty incidents just general play) happened to be right in front of us on Saturday. The pattern was consistent. Crouch waits for ball to arrive, one of two defenders nudge him out the way, ball arrives - Crouch fails to get ball because of push - yes he should be stronger but that doesn't alter the fact he was being fouled every time. He was also awful though and Pav and Lenny was what was needed. Windy, I agree that the Jagielka/Neville sandwich wasn't a foul. However, if you watch again, there were plenty of other instances that were, in my opinion. With regard to the sandwich, however, you perhaps should be asking how Crouch can get to the flight of the ball when he is being deliberately prevented from doing so by two Everton players. You seem to have watched or been involved in a lot of football in your time, as have I. You should therefore be able to see when players are challenging fairly and when they have set out to deliberately foul or obstruct a player to prevent them from playing. A fair challenge needs strength to resist and may the best man win. A deliberate attempt to stop a player playing when you are not trying to get the ball yourself should not be condoned under any circumstances. In my view, this happens far too often and referees seem to adopt the attitude that you are adopting. However, they are inconsistent. I still don't see how you can say that Crouch should toughen up and yet see nothing wrong in what Yakubu did, going down under a challenge that didn't merit it. Why do we have to accept cheating in the game? Isn't the referee meant to ensure fair play, or don't you think that it matters? Anon @ 16:13 - thanks for your comments, you raise some interesting points. I thnk in the Yakubu situation, the key was that he had the ball, he beat Kaboul, and Kaboul pushed him. We all know that it doesn't take much for strikers to go to ground - rightly or wrongly. I don't like it, but I'm pragmatic - our players profit too - i.e. Bale against Twente, he was going to ground before te challenge arrived, etc etc. My comment on Crouch toughening up was more of a general point - I think that far too often he is outmuscled, and I think he needs to work on his core strength (although it's probably too late for him now anyway). did you see this stat in the guardian? "in the past three seasons Crouch has scored 19 goals in 84 Premier League matches. In other competitions, against teams less familiar with his strength and weaknesses, he has scored 22 goals in 37 games." pav ought to be getting the start ahead of crouch in league matches until JD is fully fit. he seems to have improved his first touch in recent appearances, and as has been mentioned, his chief asset is movement. 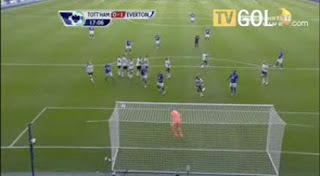 crouch is an ent in the box, generally rooting himself near the far post. the only success he's had this season is creating some havoc (like the howard error that led to goal) but i don't think anybody believes he's really going to score. pav on the other hand makes diagonal runs that free up space. with him i think Modric can get more looks with the space that opens in the middle. 1) The cliche goes that playing 4-5-1 in the EPL needs a "30 a season man". Actually it's more like twenty - but even that target is probably beyond Crouch. He makes a good stab at leading the line, but his movement and finishing is simply not of the required standard. Prem opposition are increasingly wise how to play him out of the game. Whether Defoe can lead the line is yet to be seen, but at least it gives us a Plan B of switching to a tried and tested 4-4-2 with JD and Crouch up top. Come to think of it, it really is pathetic that with 5 international forwards in our books, only one partnership is remotely effective. 2) If you're scoring less, then you need to be conceding less too. The concerning thing is that we are conceding most games now. One element of this is the centre back injuries, which hopefully should be eased by Dawson’s return and a January purchase too if possible. The other element is fullbacks. We play two attacking FB’s now, which is necessary because our attacking threat is so diminished. Both our fullbacks are awesome up top, but both have question marks over defending (particularly Hutton). Also, a lack of a disciplined DM to cover their surging runs adds to the problem. 3) It's a shame not to see Kranjar, but this 4-5-1 means we NEED pace on the wings, so until Defoe returns he'll likely not get many chances. 4) Our other midfielders increase their goal threat. All our goals are coming from midfield at the moment – well, VDV and Bale to be accurate. Moyes correctly realised on Saturday that if you heavily shackle these two then the rest of our midfield are, frankly, less than five-a-season guys, so we are nullified. Modric/Hudd in particular need to work on their runs and shooting, otherwise I believe Jenas – despite his inferiority at keeping possession – will need to be played instead (as he already is beginning to be). I’d almost be curious to see a midfield of Sandro/Jenas/VdV given a try in away matches. 5) January will be key for us. - Pacy right winger to replace bentley, so when Lennon is out we don't change our play. IMO Walker could easily be converted to this as he is far superior in attack to defense. The first two there are overwhelmingly priorities. Mexes would the stand-out choice after his fallout with Roma. Below that, Kjaer, Tasci Cahill and Diakhate would all be improvements on Bassong, Gallas. Worse comes to worse, we could do worse than Chris Samba if none of the above are available. And, go on, do a loan watch! Windy from Block 53 the first haslf sandwich was a definite foul. If you watch Jagielka's reaction he knows he is going to be lucky to get away with it so he plays dead.